sorry but still the approach checklist starts at green dot speed calculated at 250 kts and the copilot wants to set flaps 1. I thought it will be fixed in 1.04 but the problem still exists. as mentioned in an earlier thread: The speeds we use for the copilot functionality are the ones from the MCDU - PERF - APPR page. We have no other opportunity resp. those are the only values available and the right ones. So if there are problems related to those speeds then this is a problem of the MCDU calculation and I will move this topic to the respective chapter of this forum. Same here, I have to disconnect the copilot at 10.000 ft. Strange I don't have this issue in 1.04, ( always below 230 kts IAS), are you sure you were not to heavy ? 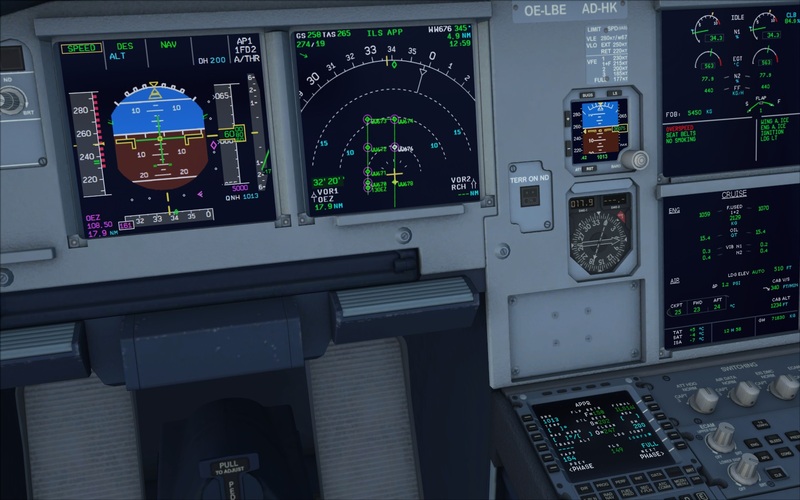 Clean install, FSX+Airbus extended 1.04, only. The issue remains. The clean speed on the MCDU is at 247 knots. Also your GW seems to be very heavy. So your APP speed also is 154 knots and normally to High. Same here. Overspeed in the tutorial flight. Clean Speed was at 248 knots! Yep, just happened to me too on approach to Prestwick. 117 pax, 3.6T cargo, 8T fuel. Flaps 1 at 250kts and an overspeed warning. Ok, your Setting is correct, the hint is the Calculation of the clean Speed at the MCDU. That is the Key for a solution of the problems.. I hope this will fixed soon. There are two reasons for those too high speeds (causing problems only if the TO weight is quite high (nearly at the max. weights or above). The automatically calculated MCDU ZFW value is wrong - it is instead the TO weight. Therefore please use the ZFW calculated by the Fuel Planner and overwrite the shown value. Many users are requiring a "real" Airbus with all functions but do not handle the plane as a real pilot. Normally it is one of the PF duties to check and keyin the values like ZFW as well as BLOCK FUEL - but we wanted to make it easy for a lot of users and so this problem occured. If the right ZFW will be used the O-speed is already reduced by app. 20 knots. Additionally we check also all the calculated MCDU APPR speeds. I do not know when those changes will be released but using / keying in the right ZFW should an easy workaround. If you see the picture of Rafgath73 the calculated landing GW is 71380 but the maximum allowable LW is between 64000-66000 and tghe placard speed is for flaps 1230kts and for 1+f 215kts. So the ZFW and blockfuel input is wrong. Is an hotix in sight, reagrding this problem? I use the fuel planner in the easy way, and topcat to calculate the flight time. I think I mentioned it clearly in my statement "I do not know when those changes will be released but using / keying in the right ZFW should an easy workaround". Thank you very much for the workaround. After entering the right ZFW the green dot speed is around 230 kts now. But still I get an overspeed warning after pulling flaps 1 afer the copilot´s call. I think the value is still too high. Maybe the copilot should nevertheless be activated to ask for flaps 1 after the speed is in the correct range to move the flaps or the calculation for the green dot speed needs some tweeking.